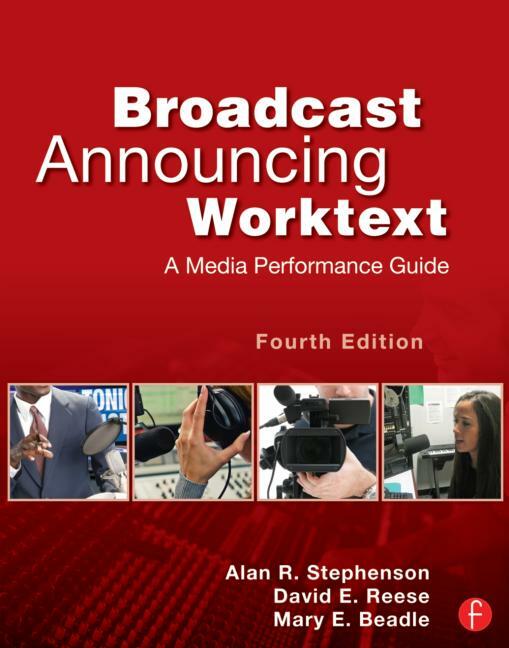 Broadcast Announcing Worktext, Fourth Edition provides you with the skills, techniques, and procedures necessary to enter the highly competitive field of broadcast performance. In addition to the principles of good performance, this book addresses the importance of audience and how to communicate effectively to various groups. Television and radio studio environments, announcer specializations and responsibilities, and developing a broadcast delivery style are just a few of the many topics covered. Many real-life examples combine traditional teaching with practical experience. An appendix of sample scripts helps students dive right in and practice key techniques. Self-study questions and projects provide an immediate check on what you learn, and the projects allow for a practical, hands-on application of key concepts. Brand new audio clips and videos featured on a companion website show proper announcing techniques, along with examples of what NOT to do. New interviews with industry professionals lend additional insight and perspective. Updated content throughout, including a new section on social media in the news, reflects the current state of the industry. Alan R. Stephenson is a Professor of Communications at John Carroll University where he teaches classes in television production and performance, supervises the JCU Media Archives, and directs the graduate program. Prior to his academic work, he spent twenty years in broadcasting and cable in virtually all phases from documentary production to performance and management. His work included regular coaching of professional talent. He has authored numerous articles related to the media field. David E. Reese is a retired professional broadcaster. Prior to entering the academic field he worked in commercial radio in central and western New York and held positions from announcer to account executive to general manager. Most recently, he was General Manager of KUNV radio at the University of Las Vegas, Nevada and taught broadcast courses in the Greenspun School of Journalism and Media Studies. He has also been a manager and professor at John Carroll University (Cleveland, Ohio) and Wabash Valley College (Mt. Carmel, Illinois). He is the author of several articles on college radio, numerous book reviews and, with Lynne S. Gross and Brian Gross, author of Audio Production Worktext, 6th Edition (Focal Press). Mary E. Beadle is a Professor of Communication and Chair of the Tim Russert Department of Communication and Theatre Arts at John Carroll University. She previously served as the Dean of the Graduate School at John Carroll and Provost of Assumption College in Massachusetts. She was founder and chair of the Communications Department at Walsh University in Canton, Ohio. During that time she co-hosted the award-winning radio program, "Wineskins." She has conducted seminars in Russia and Latin America and has published numerous articles on media history and international media.